Dentist Sarasota Florida: How does plaque cause a cavity? The plaque that forms on your teeth and doesn't get washed away by saliva or brushed away by your toothbrush produces acid as it eats up sugar. This acid is produced inside the plaque and can't be easily washed away by your saliva. The acid dissolves the minerals that make your tooth enamel hard. The surface of the enamel becomes porous - tiny holes appear. 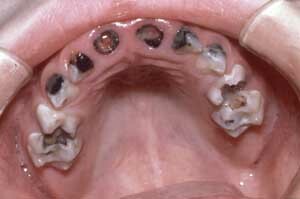 After a while, the acid causes the tiny holes in the enamel to get bigger until one large hole appears. This is a cavity. It's important to see your dentist before a cavity forms so that the plaque you can't reach with your toothbrush or floss can be removed.